Vulcanic cartridge heaters are designed for the heating of metallic parts (moulds, dies, plates, bolts, etc.) and of liquids up to several kW, 2500 mm, 750°C, from 12 to 450 V 1-ph or 3-ph. Vulcanic cartridge heaters must be inserted in a hole in order to heat solids and can heat a liquid directly or through a thermowell. 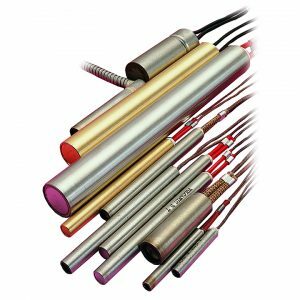 Cartridge heaters comprise a stainless steel cylindrical sheath with a diameter of 6.35 to 31.8 mm ensuring good sealing and shock and vibration resistance. Power is supplied via fiberglass-sheathed copper or nickel cables with optional mechanical protection by a flexible metallic sheath. Cartridge heaters can be equipped with a threaded plug, (metric or BSPP), a flange, a mounting bracket or shoulder. Waterproof resin seals guarantee electrical insulation in case of prolonged storage or use in a wet atmosphere (max. temperature at connection: 160°C). 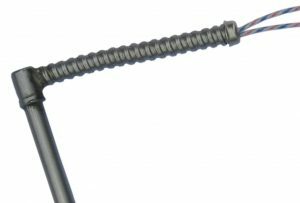 As an option, a thermocouple sensor type J or K inserted in the cartridge heater enables the temperature to be controlled and limited. Vulcanic cartridge heaters are designed and manufactured either as part of our standard range or as a customised solution (variable heating zones, double insulation, integrated thermostat or thermal fuse, etc.) in our factory in St. Florentin.